← Hi. My name is NanaBread and I’m a Peppermint Bath Product Junkie. It's okay to play with your food! Start by making hummus. You can do it! Some recipes are so forgiving and fun, making them is more like playing with your food than following a recipe. They almost beg for experimentation. Once you get the basic formula down, you can free-style and add whatever you like. For me, hummus is one of those foods. It’s quick, easy and delicious and it’s actually good for you (but don’t let that turn you off). I make this in my food processor, but if you don’t have one you can use a blender. You’ll just have to stop more often and scrape down the sides as you go. Here’s how I like to do it. In a food processor, dump in one whole can of garbanzos, juice and all; drain the other can and dump the drained beans into the processor. Add the tahini paste (a required element – trust me), the salt and garlic salt, and the olive oil. Turn on the food processor and blend until the mixture is creamy and smooth. Don’t remove it from the food processor just yet. Now it’s time to play with your food. I like my hummus chock full of lemon, garlic and cayenne pepper, so at this stage I add 2-3 tablespoons of freshly squeezed lemon juice, the zest of one lemon, an additional teaspoon of garlic salt and ¼ teaspoon of cayenne powder. I give it another minute in the processor to blend, and then give it a taste. I add more lemon or salt or cayenne to my liking until I think it’s perfect. Here’s a hint about the cayenne powder – it will get a little stronger as it sits, so don’t add too much. You can always sprinkle a little more on top just before serving. I also like to add a drizzle of extra virgin olive oil over the top. My point is to start with the basic recipe and then let your imagination run wild. 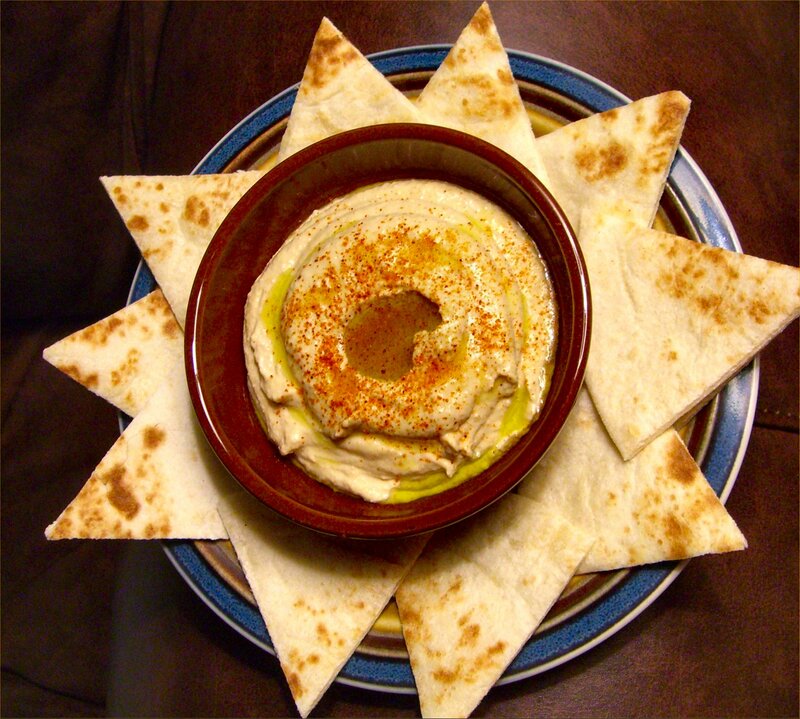 Hummus is inexpensive and easy to make, so why not experiment and try new things? It’s also really yummy. You can eat it as a snack, as a side dish, or as your main meal. I had a bowl with toasted tortilla wedges for lunch today (pictured), and it was fabulous. You need to try it very soon. Don’t be intimidated – just get in there and be creative. Just because we’re grown-ups doesn’t mean we can’t color outside the lines from time to time. Be a rebel, experiment often, and don’t be afraid to play with your food!